The selected full-text articles, which are related to following topic and their sub-titles, will be published as international book chapters by an international Publisher after further revision. All Book Projects are totally independent from ICOAEF’18. Authors can join these book projects without joining ICOAEF’18. 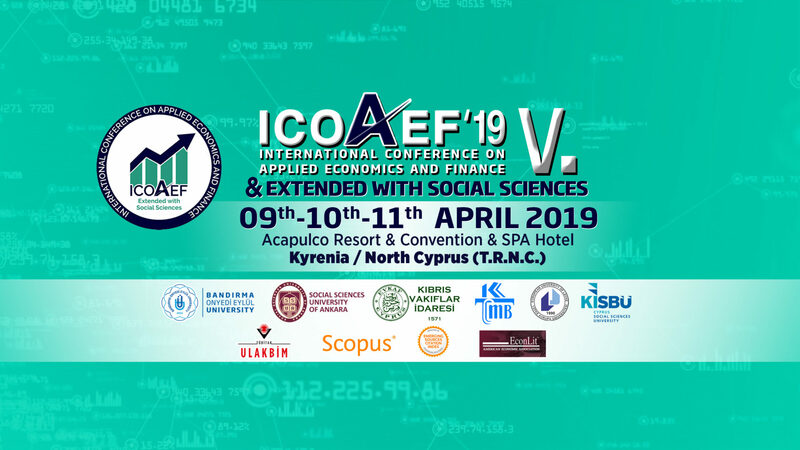 There’ll be no implication such as ICOAEF’18 logo on book projects. Please send an e-mail to icoaef@gmail.com if you want to register as author for book projects. This publisher meets the criteria of associate professorship. Each section of the books, should be minimum 20,000 blank characters, maximum of 30,000 blank characters including bibliography. Editors may request corrections / edits depending on what is needed in the papers prepared for the chapter. Translation per section, review of papers sent in English, proof reading and printing&publishing costs are 225 €. Even if the section is sent in English, the fee will be fixed again for the service will be provided by the translation company.After payments are completed for chapters, the copyright transfer contract will be requested in the signature phase. Payments will be made via the payment link added to the call for chapter section on our icoaef.com page.